A desk is a piece of furniture with a sloping or horizontal top designed to aid writing or reading, and often containing drawers, compartments, or pigeonholes. There are many types of desks, including desks designed specifically to house a desktop computer and its varied accessories. If you decide to buy a computer desk with a CPU enclosure, be sure that the desktop computer unit is adequately ventilated during use. Desks built specifically for computer workstations usually have a monitor shelf, holes for routing cables, and space for a keyboard, mouse, printer, and speakers. Many times they have an adjustable keyboard tray and sufficient storage for folders, media, and other items. 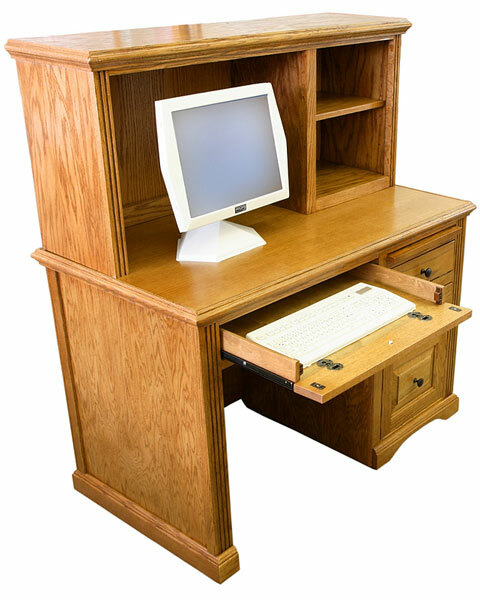 Many computer desks are ergonomically designed, which means that they are built to maximize user comfort and efficiency. Heights and angles of the monitor shelf, keyboard tray, chair, or the desk itself can often be adjusted to achieve ideal placement for the particular user. This is important so that shoulder, wrist, and eye strain issues are avoided when working with computer equipment. When choosing a computer desk, there are many factors to consider. The space where you will be putting the desk will determine its size and its shape. You'll also need to think about how much work surface space you require. If you do the type of work that requires lots of paperwork and other materials, you'll need something big enough to spread your work out on. If, on the other hand, you use your computer solely for surfing the net, a smaller desk will do nicely. Be sure to consider your storage needs as well. Divided storage space ensures that you can keep things organized, while special shelves can provide space to store specific items such as your keyboard, computer tower, scanner, printer, and CDs. 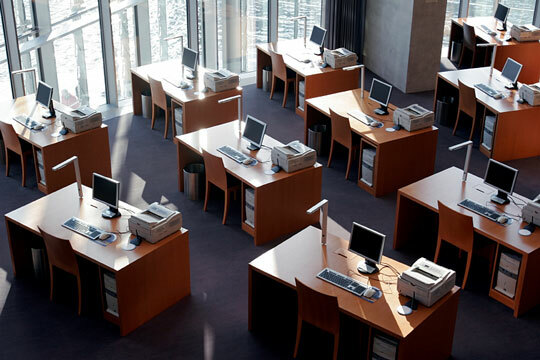 Types of computer desks include single-user computer desks designed for home or office use, large multi-student computer desks used in computer labs, and small rolling lecterns or computer carts just large enough for a laptop. Rolling computer tables are often used where a desk is not convenient, whereas freestanding and wall-mounted or table-mounted computer stations are sometimes used in public libraries and Internet cafes. As technology continues to advance, the types of furniture available to house computers will continue to evolve, creating increasing convenience for computer users. Paragon Furniture features work center learning solutions for K to 12 and higher education classrooms. Spectrum Industries offers a broad spectrum of computer desks, carts, and workstations. The Balt division of MooreCo is a manufacturer of ergonomic computer and office furniture. Smart Desks designs, manufactures and supplies computer classroom desks. Smith System computer furniture is designed to help students work comfortably and successfully with computers. Versatables offers an extensive selection of innovative computer lab furniture. Workstation Furniture features information about computer furniture ergonomics and a directory of computer workstation manufacturers. Computer Furniture is a directory of computer furniture vendors throughout the United States. Classroom Furniture - student desks and workstations. Ergonomic Chairs - computer chairs and office seating.